Providing electricity and gas services to over three million customers in Michigan requires DTE Energy staff to drive vehicles they can rely on. The company maintains a fleet of nearly 5,000 vehicles, which includes around 300 natural gas vehicles (NGVs). Each vehicle logs about 18,000 miles annually. “Being a natural gas utility, we’ve always been interested in using CNG as a vehicle fuel,” says Mark Johnson, Director of Fleet Operations. 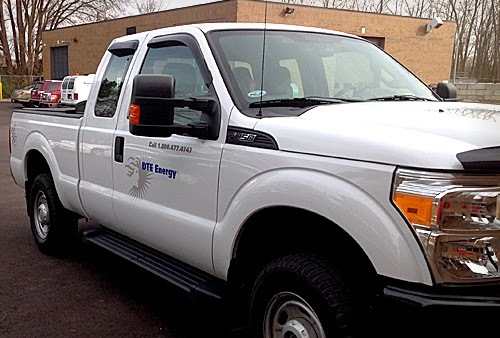 One of DTE Energy's 300 natural gas vehicles: a bi-fuel Westport WiNG™ Ford F-250 pickup. The company’s field staff and supervisors spend a significant amount of time driving to customer sites, setting up utility service and responding to power concerns, among other duties. Several field staff drive bi-fuel Ford F-250 Westport WiNG™ Power System pickups and many will soon drive the Westport WiNG Ford F-150 dedicated compressed natural gas (CNG) pickup; the company placed orders for Ford’s first-ever offering of the CNG-capable F-150. DTE Energy is no stranger to NGVs – the company started deploying them 25 years ago. In the past, the company did their own conversions, but has since transitioned to partnering with Ford qualified vehicle modifiers (QVMs), such as Westport, when adding new NGVs to their fleet. The company currently owns and operates 11 natural gas refueling stations in the lower half of Michigan. Most are located in the Detroit area, and three are located at Meijer stores. Most of the stations are open to the public. Mark says the company chooses natural gas powered Westport WiNG Power System vehicles because they use same internal combustion technology as a gasoline vehicle. The only difference, he notes, is technician certification and tank inspection.